Our Medieval Kettle 1.25 Gallons size will add a bit of realism to your medieval camp. 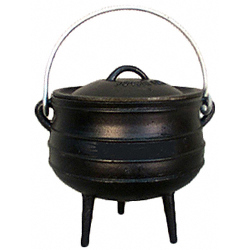 These cast iron cooking cauldrons are designed to be used over an open fire (or gas burner). This size Cooking Pot includes a well-fitted lid and carrying handle. Pre-seasoned with flaxseed oil and made from pure gray cast iron. This size is the most popular size for small camping fires for making stews, meats or vegetables. Our Medieval Kettle is large enough to bake rolls or cornbread. Used in the modern world for camping. Cook stews, jambalayas, paellas, seafood, Fish Fries, Beans, Turkeys, Roasts and anything you can cook over an outdoor fire. Great for cooking over LP gas burners or open fires.